Taras Yanytsky is a famous Ukrainian bandura virtuoso, Honored Artist of Ukraine, winner of the Ivan Nechuy-Levytsky State Prize of Literature and Arts, laureate of numerous international music competitions. Mr. Yanytsky is Associate Professor of Bandura and Kobza at Kyiv National University of Culture and Arts (KNUCA) and soloist of municipal Kyiv Academic Ukrainian Ensemble "Dnipro". Mr. Yanytsky has been a chair of KNUCA’s Bandura and Kobza Department, as well as Artistic Director and Conductor of three different entities - Bandura Choir of High Pedagogical School of Kobza Art in Stritivka, Borys Grinchenko Kyiv University and KNUCA. Furthermore, Taras Yanytsky masterfully introduced bandura performances into plays of Kyiv drama theaters and was featured as a composer and innovator in several modern productions that were a tremendous success. The bandura is considered the national instrument of Ukraine. It is a multi-stringed folk instrument with a history dating back to the seventh century. Extremely popular among the Ukrainian Cossacks, it was adopted by the “Kobzari”, itinerant blind minstrels who travelled the countryside singing epic ballads about the heroic exploits of the Cossacks. Although the Kobzari have since disappeared, the legacy of their music has survived, and is currently undergoing a renaissance. The modern concert bandura has 65 strings and is chromatically tuned through 5 octaves. The strings are plucked with the fingertips, resulting in a sound similar to that of a harp, guitar and harpsichord combined. 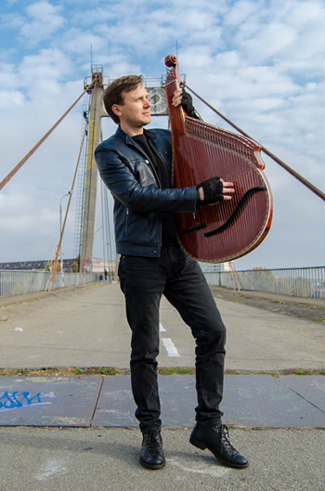 Contemporary bandura is an instrument that can play music of diverse styles and epochs.